A respectful workplace is one where you will find more engaged and productive employees. But there are times when workplaces also see a whole lot of conflicts, misunderstanding, lack of attendance and low productivity. 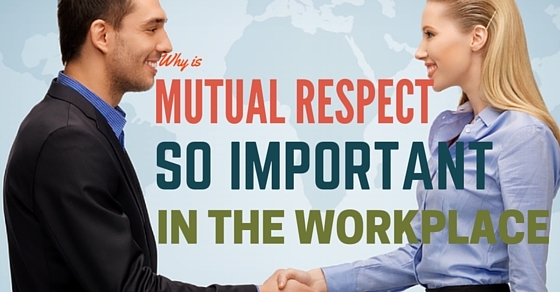 Keep reading to find out more about mutual respect in the workplace and why is respect important. One of the most important bases of any successful workplace is respect between employees. Your workplace being how comfortable it is, can never become your home. So the decisions at work, like your seating place to your colleagues in a team, all are decided by others. And you will be not allowed to change things as you like. What is Diversity at Work? If your workplace comprises of mixed kinds of employees who are different from each other by race, religion, culture etc or having people from various regions, then it is called a diverse workplace. Having a diverse workplace is very important because the boost it gives to the company will be high and productivity also increases. In this section we are going to talk about the importance of respect at the workplace and why should you encourage people to respect one another no matter what! One of the biggest and most wonderful benefits of respecting one another in the workplace is that you begin to improve your relationships with the people around you. If you respect one another at work, automatically you will be able to respect everyone around you. In that way, your relations with others will definitely show a sign of change. It will become more positive. Bonds will be strengthened and people will work in harmony with one another. Isn’t that what a happy workplace is all about anyway? A second benefit that comes with respecting others at your workplace is that it reduces stress greatly. It makes you a stress-free person and also reduces the work pressure at the same time. If you respect and love one another at work regardless of the differences, you will be able to understand and communicate with each other in a better way and that will help you balance work life and take care of stressful situations easily. At this point, you will be working together as a team instead of working separately. Respect is highly essential in a workplace as it improves the environment in which you are working. The thing with mutual respect and understanding also means you will not discriminate against others. You will not show any signs of prejudice or racism. Instead, you will try to sort things out without much fuss and chaos. And that’s what sets people apart! To establish a fair and good working environment, it is essential to treat one another like they are of your own. Only that can help in developing a healthy workplace. Respect at work can also boost productivity. The idea is quite simple. When people work with one another with peace and harmony, they don’t have the time to focus on other shallow and petty ideas. People will be more interested in finishing their assignments and boosting the levels of productivity at work. Nobody will be worried about what the other person is thinking. The goal will be to the company itself and that will definitely help the company improve significantly over time. The thing with respecting one another is that it won’t lead to any conflicts or problems. Working in an environment that preaches mutual understanding will always help in sorting things out without much stress and we guess that’s what everyone wants to see these days. Ultimately it makes your workplace fun and happy place to be in. If you really want to see your co-workers happy, you must remember to show enough respect and love for one another. A wonderful benefit of having respect in the workplace is that it boosts chances of knowledge. People will be able to learn a lot about each other and improve their relationships as well. Having immense knowledge and understanding in a working environment will definitely occur when you begin to trust and respect one another. Although it can get a little difficult to respect one another at the workplace, we have some solutions that can definitely improve the situation at your workplace. Keep reading to find out! Sensitivity training is something that can be tried in a workplace that has been infected with harassment of all kinds including discrimination and sexual harassment. The training which has been used in designing and promoting awareness among individuals with accountability, as well as awareness in the workplace, is what makes this training popular. The training is usually one on one and among employees and other readers. Another thing that can definitely improve the situation at your workplace is workplace investigations. It will reduce allegations, violations of human rights such as discrimination, harassment and sexual harassment. It can be done by lodging a complaint to the legislation and policy. Cohesive initiatives will combine the assessment of the workplace by using a small group of facilitation that will help the participants understand this issue as well as facilitate restoration and discord of any kind. It will ensure relationships which are healthy and cohesive. How to Demonstrate your Respect in the Workplace? Respect is very important. If you want a good working place, always remember that you have to give people the respect they deserve. And in order to respect people at work, here are a few things we would suggest to do. Practising will definitely improve the atmosphere at work. One of the best ways in which you can show respect to each other at the workplace is by being polite to one another. No matter what the situation is, you don’t have to come across as mean or rude to people around you. If someone is not being nice to you, don’t bother or worry so much about it. We would request you to still be nice to the people around you. Don’t lower down to their level. Being nice is a wonderful way to respect and understand people at work. The second thing you must do is get a grip on your anger. Don’t let small things piss you off at work. Be patient with others and learn of ways in which you can control your anger with others. Also, you must include others in the conversation so that nothing goes wrong with the conversation. Also, take note of the things that make you angry and try to keep away from people who instigate you or do things to annoy you on purpose. If you really want to respect people in your workplace, we would suggest you not to judge them at all. Judging is a horrible thing to do. When you judge others, you don’t give them an opportunity to get to know you. You should know that judging can never lead to something positive. It will, in fact, ruin your workplace and make you even angrier and aggravated. You won’t be able to have that peaceful environment you have always wanted to live in. Help people around you. Don’t discriminate people or put them down. If you can help them with something, you should go ahead and do it. Helping is a wonderful way to communicate with people, to learn about them and to most importantly respect them. Those of you at work who feel like have nothing to do should definitely go out of their way and help people as much as possible. It will simply improve your impression and create a good environment to work in and that is something we all want, don’t we? Finally, you must encourage the people around you. Call a meeting and speak to your employees about how much you want them to inspire and encourage each other. That would definitely be a great way to get people to respect and love each other a lot more at work. This idea has worked wonderfully for people at work. In fact, experts have spoken of its benefits and if you try it today, we bet it will do the same wonder for you. Just go ahead and give it a shot today. How to Show Respect to Others? Being loved and getting respect from others is always liked by others. Having a sense of attitude, positivity and gratitude works very well in any relationship. Usually, the responsibility lies on both the parties in managing mutual respect in a relationship. You might have also heard that “give respect and take respect“, which means that how you behave with others depends on how you get back a response. Be straightforward but be respectful. Acknowledge when others are right. This brings the post to an end. Always remember that misunderstandings and conflicts are quite common in the workplace. But that doesn’t mean it will last forever. By showing respect to one another and communicating every day, you can improve relationships with them easily. The importance of respect in the workplace helps in maintaining a respectful workplace. All you have to do is make a note of the points given above and implement them in the future. It will definitely help you in the long run. Apart from that, if you have any doubts, questions and queries regarding the post, do let us know in the comment box below. We would love to hear from you. On that note, good luck! Next articleHow to Create a Paperless Office Environment?